The new Samsung Conquer 4G smartphone that was coming to Sprint. The phone was initially set to sell for about $100. But it turns out if you pre-order the Conquer 4G right now at Radio Shack you can get it for just $19.99! Radio Shack is offering the Conquer 4G on Sprint for under $20 if you agree to a new 2-year contract and a data plan. That makes this smartphone one of the cheapest you can get before you consider the Android OS and 4G capability. The device runs Android 2.3 and has a 3.5-inch touchscreen. The resolution is 320 x 480 and it has a single-core Qualcomm processor. The front camera is a 1.3MP unit with a 3.2MP rear camera. This is not bad at all for a $20 smartphone. 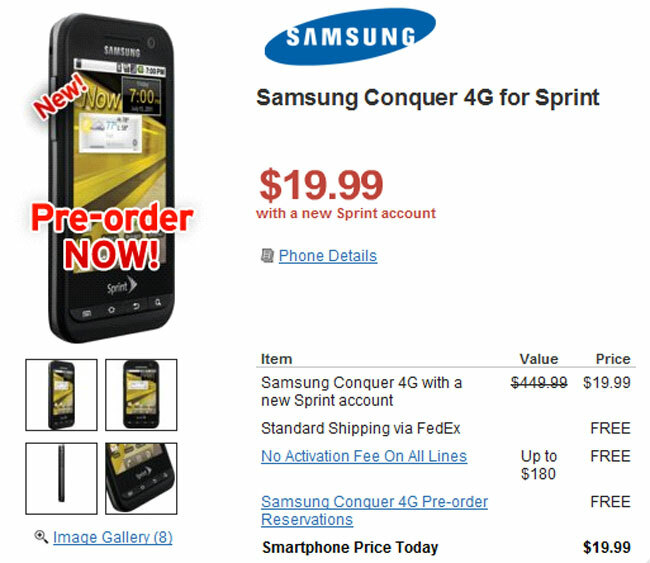 Buy one, get one free Samsung Conquer 4G from Sprint!